Q-Snaps. 17 Spare Pair  - $10.00 : Yarn Tree, Your wholesale source for cross stitch supplies. Item 2970. 17" Spair Pair. [original item SF17PR]. 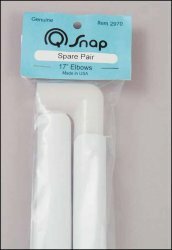 Extra sets of elbows with clamps for your 11"x17" or 17"x17" Q-Snap frame (Item 2499 or 2495).